This paper examines the potential—both opportunities and risks—for enhancing the role and effectiveness of multi-stakeholder partnerships (MSPs) as a modality for scaling up innovation, resources and action to deliver the Sustainable Development Goals (SDGs). 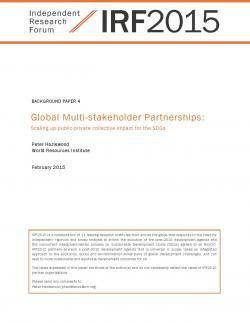 MSPs (also referred to as cross-sector partnerships) span a wide and diverse array of institutional arrangements for expanding collaboration between government, business (and other private sector actors), civil society and/or UN and other multilateral agencies to address development challenges. The focus here is on global MSP mechanisms (that typically operate at multiple scales), which have become an increasingly important element of the international development architecture and feature strongly in the global dialogue on a post-2015 sustainable development agenda. The paper is in three sections: (i) basic features of global MSPs and a brief overview of lessons from experience regarding their potential benefits and risks; (ii) some key design principles for enhancing the legitimacy, effectiveness and development impact of MSPs and to mitigate the risks; and (iii) issues and options for expanding the role of global MSPs as part of the means of implementation for the SDGs.